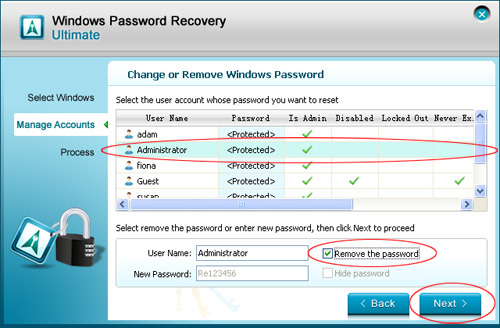 Windows Password Recovery Ultimate resets any Windows password including Domain Administrator (Active Directory) or other user passwords. It also supports change password and create new admin account. By burning a bootable CD/DVD or USB Flash Drive, you can:1. Reset Windows local and Domain password 2. Change Windows local and Domain password 3. Create new Windows local and Domain user accounts. Easy-to-use tool designed for resetting any Windows local and domain password. 100% recovery rate. Recover Windows password without any data oss. Supports burn CD/DVD reset disk on any accessible PC, then reboot the locked PC from the disk to reset password. Create a bootable USB drive on Windows system, and then reset password via it. This is highly recommended for it is more environmental, economical and convenient compared to the CD/DVD. Download and install Windows Password Reset Ultimate on an accessible PC to create a password reset CD/DVD or USB drive. Support all brands of PC including Dell, HP, IBM, Asus, Sony, Lenovo, etc. The ultimate password recovery tool for Windows. Qweas is providing links to Windows Password Recovery Ultimate 8.12 as a courtesy, and makes no representations regarding Windows Password Recovery Ultimate or any other applications or any information related thereto. Any questions, complaints or claims regarding this application Windows Password Recovery Ultimate 8.12 must be directed to the appropriate software vendor. You may click the publisher link of Windows Password Recovery Ultimate on the top of this page to get more details about the vendor.